Get three weeks of any Sonlight Instructor’s Guide – FREE! Thank you, Sonlight, for such lovely books! I have complete trust in the Core selections, knowing my kids will be absorbed and stimulated. I can relax, knowing I will have plenty of help from the well-prepared notes, to discuss, with grace, any difficult issues they may encounter. Additionally, one of the best things about Sonlight's Science program is the interest it inspires in the real world. Our whole family is enjoying this journey of discovery by taking a day each week to explore a local nature reserve. I'm amazed at how this consolidates concepts we've just learned about. Here, Evie (7, Core B) and Corban (4, P3/4) enthusiastically explore a marsh. Sonlight's grab-and-go Instructor's Guide makes it possible for us to homeschool. We live on a cattle ranch and homestead (produce much of our own food), so I wouldn't have time to design a curriculum. Sonlight has brought the world into our house. I love that my kids embrace diversity as a direct result of exposure to Sonlight books. They regularly impress people with the depth of their knowledge. They want to be explorers and adventurers, just like the ones we read about. On this day, Dalton (5, Core A) and Maddy (3, P3/4 Multi-Subject) explore the creek. Sonlight's lesson plans, study guides and teacher helps saved our homeschool. After our first year of patchworking together a curriculum, my husband said, 'If this is what homeschooling will require of you, we won't be continuing!' Then a friend introduced us to Sonlight while we were on furlough from the mission field and we fell in love with it. No more patchwork – Sonlight saved my sanity! Three high school graduates later (with three more to go), we're STILL loving Sonlight. In the family's twelfth year of Sonlight study, Deborah (13, Core G) enjoys a good read in the strawberry patch. All Sonlight programs rest on the foundational Instructor's Guides (IGs) – the cornerstone of our product line. We offer three types of guides: one for History / Bible / Literature, one for Language Arts, and one for Science. Each History / Bible / Lit IG includes two primary components. First, a complete schedule for everything your children will study – each day's assignments. Second, a carefully edited set of teaching tools that expand upon and direct your study. After I've outlined a basic schedule for a full 36-week school year, the product development team transforms my notes into an easy-to-use grid. They lay out the 180-day schedule on 36 pages – five days per page, or the equivalent of 36 five-day weeks. Some customers follow the schedules in the Sonlight Instructor's Guides rigidly. Others read ahead, or sometimes drop a book. I suspect that, overall, most people follow the schedules fairly closely, even if they have to play catch-up in some areas. By the time we're ready to begin creating the Sonlight Instructor's Guides, I've often read every book two or three times to be sure it really is the best for the curriculum. Once I've finalized the schedule, I read each book slowly one more time, looking for details I want to highlight. Most books include at least a few words outside readers' normal vocabulary. I highlight these words, and my team then creates a list that includes the word displayed in context, along with a definition. Some customers use these lists after each day's reading to reinforce the vocabulary. Some read over the lists in advance, to be prepared for the unusual words when they read them. They can then define the words on-the-fly: "Dan looked at Joan quizzically – which means questioningly." Finally, some customers don't pay much attention to the vocabulary words until they're really stumped. When that happens, as one mom said, "Ninety-eight percent of the time, the word will be right there in the IG!" These vocabulary words serve as a mini-dictionary for each book. Authors, especially authors of historical fiction, refer to things and people whose names may have been common knowledge at the time of the book's setting, but mean little to modern readers (hoop skirts, for example). My team does the background research necessary to provide brief, useful descriptions. These cultural literacy terms serve as a mini-encyclopedia for each book. For all the History books, I try to identify the most important points, and ask questions about them, including the answers for easy reference. You can use these questions for review, to reinforce the reading (and to reassure you how much your children are learning). The Read-Alouds also have some comprehension questions, i.e., "What does Wilbur want? (a friend)." For the first few years, your children will most likely read their books aloud to you, so you'll know whether they understand what they're reading. But once they start reading independently (perhaps in third grade or so), you may want to make sure they're understanding their Readers. And so I suggest questions you might like to ask – and offer brief answers, so you can confirm that they're understanding the book without having to read alongside, if you're short of time. Besides comprehension and summary questions, I also ask open-ended thought questions. "Have you ever felt like that?" Or, "What do you think would be a better response?" Of course, you're free to use these questions as you choose. Some customers ignore them; they feel confident in their ability to ask questions. Some use them every day. Some skim them and then ask only the ones they like. There isn't a right or wrong way. The questions are a resource that's available, if you'd like to use them. Sometimes a book has a particular bias, and we want to give the other side. Or maybe a passage is less clear than it could be. I do the research necessary to provide you with further explanations, commentary, or counter-balancing arguments. I also do my best to give you warnings about specific books or difficult content, so you know what to expect and how to approach it. Sometimes a book prompts some research, and I get to share the results. In the Sonlight 100 program, the book They Loved to Laugh ends with: "Someday, Jonathan, thee will be governor of North Carolina." That's such a strange prediction – why not predict he'll be president? – it seemed likely that this was based on fact. And, indeed, the character, Jonathan Worth, did become governor of North Carolina. I like notes like that! To put the people and events you're learning about into chronological context, I point out when you have a timeline figure available that you can place in your Timeline Book. When you don't have a figure, I provide the appropriate dates so you can write them into the Timeline Book. To put learning in geographical context, the IGs include colorful maps, which double as bookmarks, and include the coordinates and location names in the IG. Click for your choice of Sonlight Instructor's Guides. The IGs aren't bound (except for Preschool and Pre-K). The three-hole punch system offers maximum flexibility to arrange and rearrange your materials. Some customers like all subjects – including Language Arts and Science – to be in the same binder. For them, we offer a heavy-duty 3" binder that's large enough to hold all three subjects. Some prefer each subject to be in its own binder. Most customers use some sort of working binder, where they pull four or six weeks' worth of assignments to a smaller binder for daily use. And we have some customers, confident in how they use their IGs, who get them spiral-bound locally. In order to easily flip between weeks, we also offer numbered dividers, or tabs, for all 36 weeks. Let's look at both of these features in greater detail. High school students should be able to work with relatively little parental oversight. Thus, the high school courses don't include books defined as Read-Alouds. The programs include numerous titles, all intended for students to read on their own. To help students work independently, Sonlight sells both a Parent Guide and a Student Guide for each program. The Student Guide contains discussion and thought questions, ranging from basic comprehension to college-level analysis. The Parent Guide contains all the same notes and questions, and also includes answers to the questions. Customers use these separate guides in various ways. Some give their children the Student Guide and later discuss the answers with them. Some give their children the Student Guide and ask them to write out the answers. Some, acknowledging that discussion might be ideal, but admitting a very real lack of time, give their children the Parent Guide, and allow them to read the answers as they study, figuring that some acquaintance with the material is better than none. There isn't a right or wrong way to use these guides. Besides offering Parent and Student Guides, Sonlight also divides the high school guides by subject. In a brick-and-mortar school, students get a course catalog. They then select which social studies, English, math, science and electives will work best for them each semester. And so with you. The catalog has arranged the programs in a way that usually makes sense: study 20th Century History as you read 20th Century Literature; study American History or Government as you read American Literature. But there isn't a natural and obvious connection between, say, Church History and, well, any Literature program. So feel free to mix things up. Pick whatever History and Literature programs appeal to you and your students the most. For High School, your Apologia science program comes with a Schedule Plus instead of a full-blown Instructor's Guide. 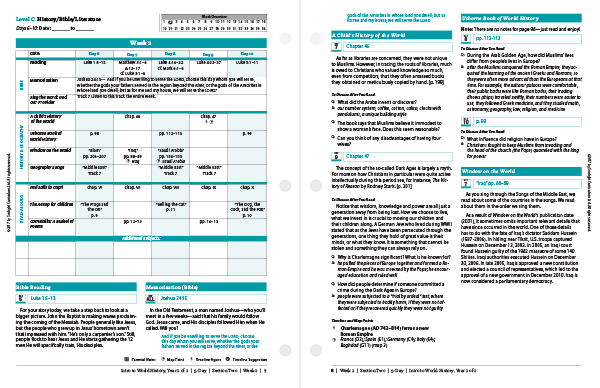 Your Schedule Plus provides the familiarity of Sonlight's IG for your Apologia studies. What makes it different from an IG? While the schedule is the same, there are limited notes as the majority of the material comes in Apologia's program. While homeschooling is a wonderful option for families, I know that sometimes it can be overwhelming. Sonlight Homeschool Advisors are experienced homeschool moms who are ready to answer your questions, offer curriculum suggestions, and come alongside when you're struggling. Then, too, there are the friendly participants on Sonlight Connections and the Sonlight Facebook page. And, finally, please sign up for emails from Sonlight. Clear instruction with extensive notes helps you confidently teach your children grammar and punctuation in an engaging manner, answer questions, and ensure that they grasp key concepts. Follow the daily schedule for a complete year of learning. Copywork/Dictation assignments help students learn the basics of writing by modeling master communicators. Most passages come from the Readers, and assignments are based on your children's age and skill level. 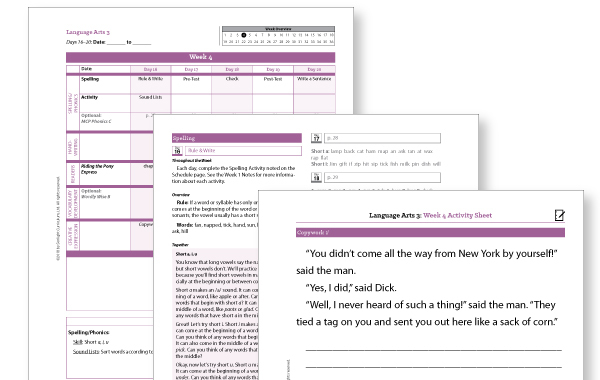 Grammar and writing mechanics in Sonlight A-W books provide specific concepts that tie into each week's copywork/dictation passage. Related exercises let students practice and solidify their learning. Effective creative writing instruction with step-by-step directions encourages exploration and sets children free to develop their creative side. 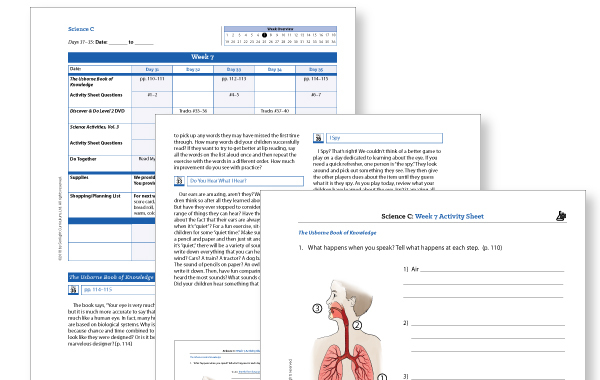 Activity sheets with answers give students a place to complete assignments. Weekly notes provide answers to grammar questions, and suggested responses for creative writing assignments. Schedules for optional workbooks offer you the option for even more instruction in phonics, grammar and vocabulary. Click here to read about our natural learning approach to Language Arts. Click your choice of homeschool Language Arts guides. 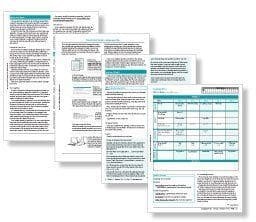 Complete, ready-to-use lesson plans schedule all your books and experiments for the entire year – no need to create your own plans. Detailed teaching notes each week explain assignments and provide extra information about important topics to help you get the most from your materials. Weekly experiments and engaging activities coordinate with your reading and provide hands-on learning. Science kits provide all the key supplies. Many experiments (such as exploring taste buds with basic ingredients like lemon juice and sugar) are intriguing, yet simple, activities that build on the day's lesson. Your children will enjoy the discoveries they make throughout the year! Organizational tools help you plan ahead, so you'll know what supplies you need for upcoming experiments. (Many are typical household items). Interactive activity sheets with hundreds of exercises, illustrations, charts and pictures help your students remember what they've learned. Activities progress with your children's abilities, from cutouts, matching, circle-the-answer and dictation, to fill-in puzzles and sequencing analysis. Reproduction rights mean that one guide will work for the entire family. Complete answer keys mirror student activity sheets for easy grading. No need to test – you'll have ongoing, reliable insight into your children's comprehension. Click here to learn about our Science programs. Click for your choice of Sonlight Science Instructor's Guides. For High School, your Apologia science program comes with a Schedule Plus instead of an IG. Your Schedule Plus provides the familiarity of Sonlight's Instructor's Guides for your Apologia course. What makes it different from an IG? There are limited notes as most of the material is part of Apologia's program. Think of the Instructor's Guides as a launching point — a point from which you can jump into learning and then tweak and modify as you go along. You can teach your children with confidence from your first day. Save yourself hundreds of hours. Find out how you can spend your time teaching your kids, not planning their education. Sonlight Instructor's Guides include complete lesson plans and notes for the entire year!